I think the hardest part about writing for NaNoWriMo is that it’s a competition with yourself. You’re not letting down anyone but yourself, and if you think about all the things you could let yourself down with, what’s a failed novel, right? I mean, of all the things to fail at, writing a novel is one that is forgivable, right? I mean, it’s not like I failed to fill the gas in my car, or do my laundry. So, going to the write-ins at the library, and various other places like Panera, Lucky’s Teahouse, and the Wild Boar have been tremendously beneficial for me. There, you compete with other people, and if you get stuck on something, there is always someone there to brainstorm with. The other hardest part of NaNoWriMo, I’m discovering, is research. When I first set out to do my novel, which unfortunately involves a lot of dead characters, I realized something very important. I, in my admittedly banal experience in life, have no idea how long a body stays at a morgue. Are they easy to sneak into? What do you call someone who works at a morgue? And sure, the silence that fell when I asked, “Does anyone know if morgues have opening and closing hours?” was followed by laughter, but it always lead to very helpful answers. But that’s sort of the fun thing about the write-ins. There is always someone who knows, or knows how to find out, and it cuts down on researching time and lets you actually get to writing those 50,000 words instead of trying to figure out what they are! Still, it’s the end of second week hump, and NaNoWriMoers all seem to have wisdom about that. The trick is, I’m told, is just to keep writing. So I am. 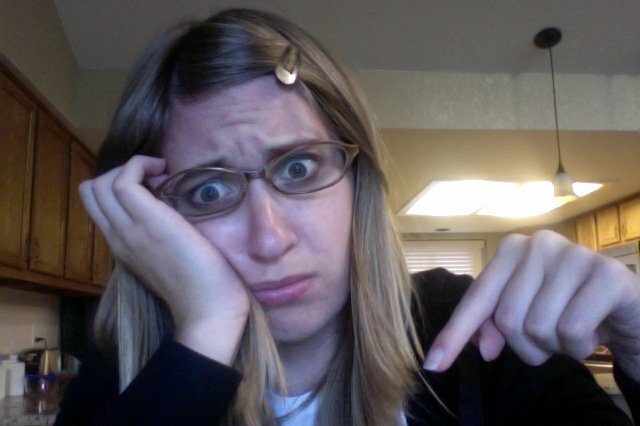 And if my face looks a little bit like this while I try to find the words, ah well. November is now over… check back to see how my novel writing went.